Have we really been doing this for 11 years? It has been a lackluster growing season for Jamie so I haven’t posted too many updates. He and Bode both lost their plants a couple of months ago so that left one still standing. With all of our backbreaking work landscaping our yard, Jamie didn’t really dedicate a lot of time to his craft (if I ever move again, I will make sure to had an irrigation budget built in because it’s a nightmare). Plus, he has been working a lot on building his greenhouse and it is still not completed. The good news is after two years of living here, we FINALLY have grass, as opposed to dirt and mud for last year’s soiree. There is still a lot of work to be done in the yard but baby steps, friends. 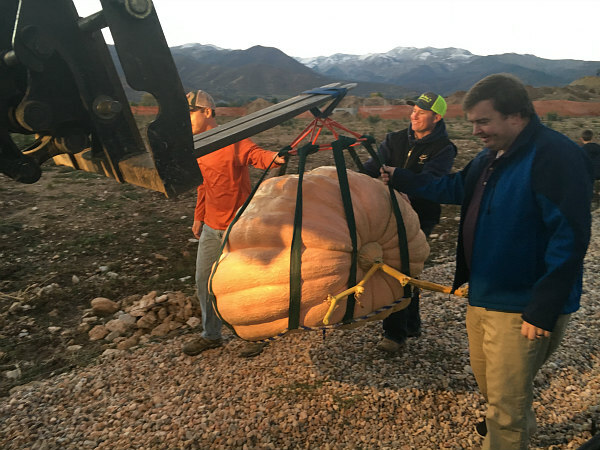 There are two pumpkin weigh-offs in Utah and since Jamie was down to only one plant, he wanted to participate in the latter weight-off to give him an extra two weeks to grow. 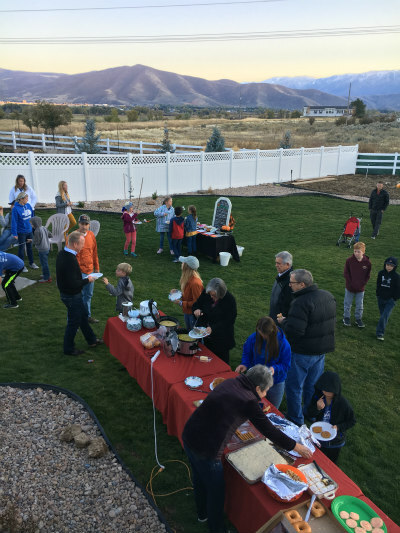 I wasn’t very thrilled about doing the party two weeks later than usual because fall (and particularly October) can have finicky weather. The entire week leading up to the party was rainy and cold with snow in the mountains. Luckily for Jamie, the day of the party was a brisk and beautiful 60 degrees…but still super chilly at night. We introduced a few new things to the festivities. I have asked Jamie to build me a firepit FOR YEARS. Heck, one Mother’s Day I even bought a cheap grill and asked him to build me a stone pit around it and he still didn’t do it. Well, that day has finally come and dare I say the firepit was one of the most popular items at the party? 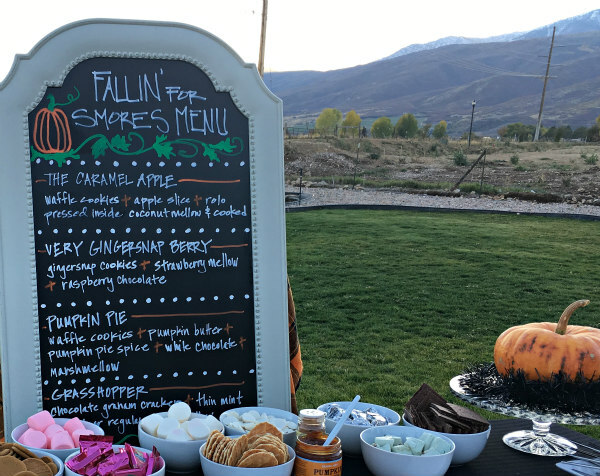 Equally as awesome is I asked Jamie’s insanely talented sister Tammy to do a s’mores bar and she delivered in her delightfully over-the-top way. Of course, the pumpkin potluck was in full force. 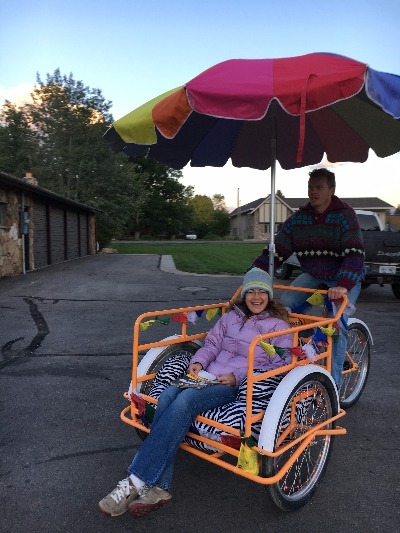 The Utah people are slowly catching on to this and there was a delicious array of pumpkin/treats but I’m still missing all of the uber creative pumpkin concoctions our Colorado friends would make. I also added two Crockpots of soup to the mix and we still ran out. Better luck next year! As for the main event, our friend Aaron drove the forklift and there was a new level of difficulty added to the pumpkin removal…the door to the greenhouse wasn’t tall enough. So, after all of the pomp and circumstance of the vine cutting, adjusting the lifting straps around the pumpkin, lifting and starting to remove it, they had to put the pumpkin back in its place and adjust the lifting straps to be shorter so they could remove it from the greenhouse. By that time, everyone had moved on to the food. Because you only get one chance to remove the pumpkin from the patch. 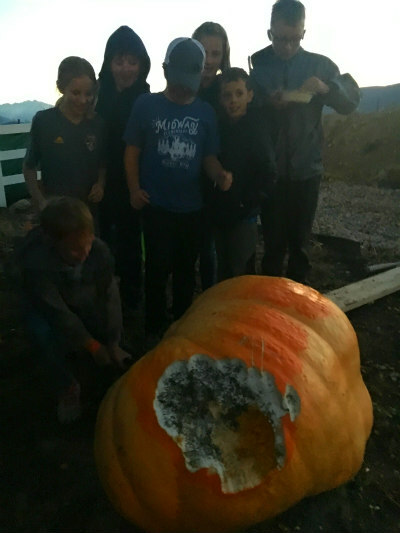 Another new element was pumpkin smashing. As aforementioned, Jamie and Bode lost their other plants early in the season. What I didn’t mention is they didn’t bother to do the upkeep on the patch after that so guess who got to remove all of the knee-high weeds a couple of weeks ago? YOURS TRULY, the one person who doesn’t even grow. And because the boys didn’t tend to their patch, there were a lot of little pumpkins growing off the vines that were now rotting. I threw many of the smaller ones over the fence for the deer to eat but I wouldn’t touch the larger decaying ones. The day before the party, Jamie had an idea. Either he could break those pumpkins down and chuck them OR we could have pumpkin pinatas and let the kids go crazy with a baseball bat. What could be more glorious that rotting pumpkin guts spewing everywhere? It was a hit. And fortunately no one got hit with a baseball bat. I wasn’t informed they had started but noticed a small group of kids forming around those pumpkins. “It there an adult supervising?” I asked. “Is there a FEMALE adult supervising?” I followed-up because, as we all know, sometimes men aren’t the most cautious in these instances. The kids were able to pulverize the small pumpkins but couldn’t even put a dent in the larger one. And now, off to the weigh-off! 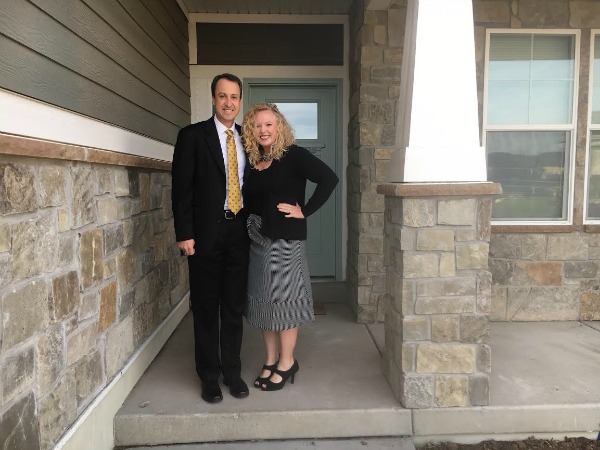 On October 8, we celebrated our 1-year anniversary for moving into our house. It was also Canadian Thanksgiving so nothing says “Happy Thanksgiving/1-Year Housewarming quite like our favorite dish from our local Mexican restaurant: The mighty Molcajete. My mom is no longer able to travel and my dad has been her full-time caregiver for quite some time. My brother Jade, his boys and his new bride moved back home while Jade looks for a job so there was a small window of opportunity for Dad to come visit. My sister-in-law Jane helped in the evenings after work and I’m super grateful to everyone who pitched in because we had a really wonderful visit. My dad spends so much of his life taking care of everyone else so it was nice to give him a break. 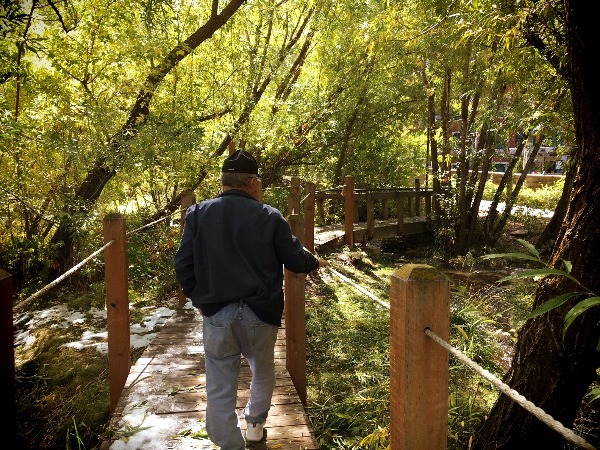 The great thing about my dad is he’s super low-maintenance and we both love the outdoors so he was easily entertained. The colors were peaking in the mountains so he witnessed some serious fall splendor. Arrival, tour of Midway and drive up Memorial Hill. 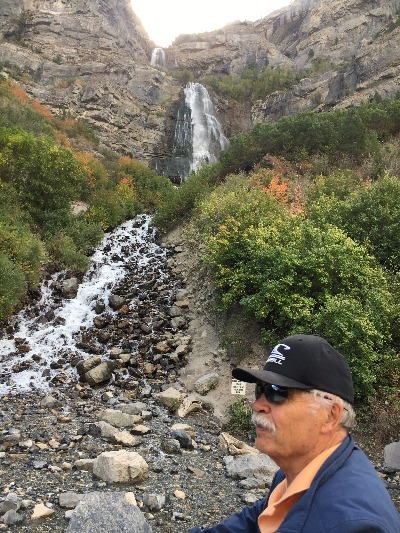 The weather forecast was iffy for the first several days so when we saw a window of opportunity, we took it to bike Provo Canyon Parkway to Bridal Veil Falls. Some of my favorite memories with Dad are of biking Calgary’s extensive network of bike paths so it was fun to share with him one of mine. That night, he treated us to dinner at Tucanos Brazilian Grill in Orem. 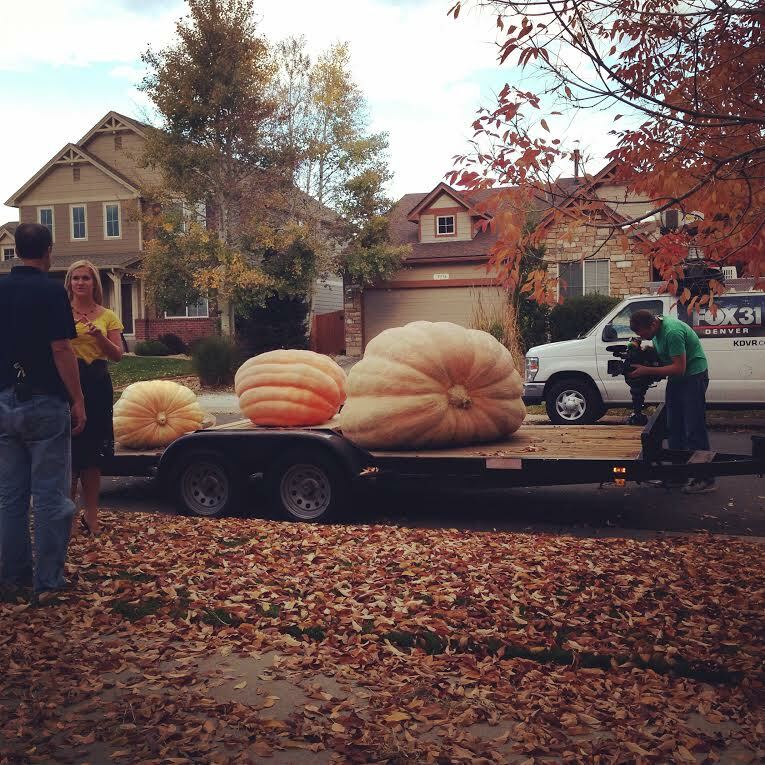 The pumpkin weigh-off. Jamie took us to dinner at Tarahumara Mexican Restaurant to celebrate. And yes, that’s a giant pear. 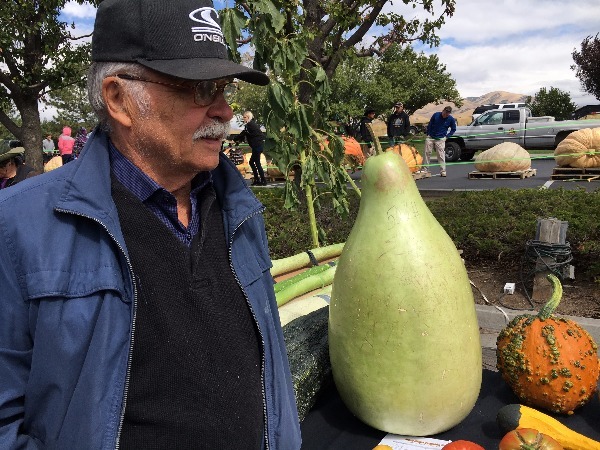 Pumpkins aren’t the only things that can be grown BIG! Church and SNOW?! This put a damper on our plans to see the Kokanee salmon run that afternoon but believe me when I say it worked out for the best. This was my favorite day! Due to our weather delay, we decided to drive up to Strawberry Reservoir on Monday to catch a glimpse of the Kokanee salmon run. If we had gone at any other time, we would have seen some of the salmon in the Strawberry River next to the visitor center (pretty cool) but because we went at this exact time, we got an in-depth look at the process in the Catch House (really cool). There are only two mornings open for the public to access their fish trap station and it was FASCINATING to see the hundreds of bright red fish. 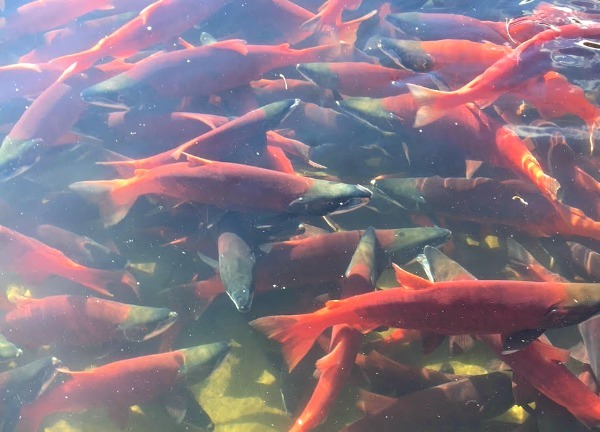 We piggy-backed on an elementary school’s tour and listened as DWR biologists talked about the peculiar life cycle of the fish and how the Kokanee usually spawn when they are four years old and die quickly thereafter. As the fish instinctively swim up the river, they are caught in the trapping station and the male and females are separated until they’re ready to spawn. 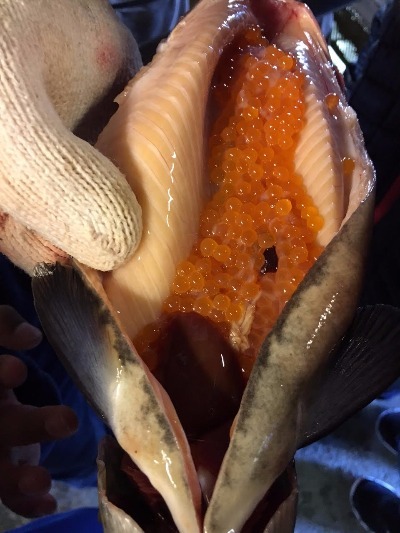 Since the females are going to die anyway, they are cut open and the eggs are squeezed out. They then take the males and squeeze the milt out of their bellies and fertilize the eggs. In the wild, the average female has 1,200 eggs but only two survive in the wild. 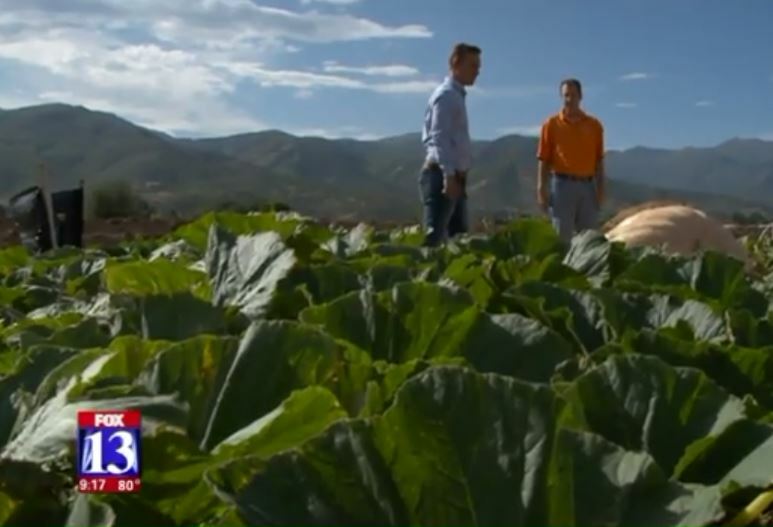 Through this process, there is a 98 percent survival rate that helps guarantee the survival species in Strawberry Reservoir. 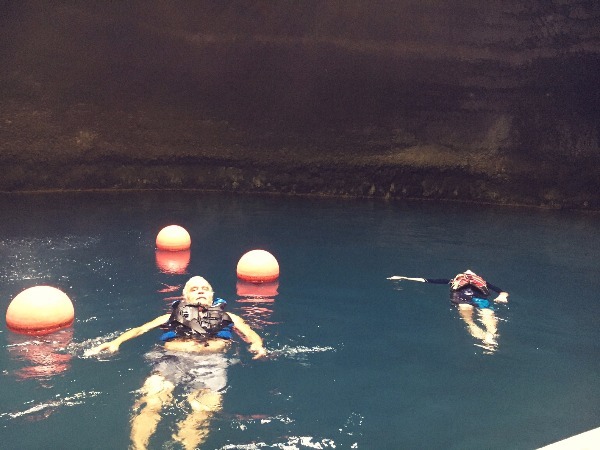 One of Dad’s must-do activities was a leisurely soak in the Homestead Carter, a geothermal spring hidden in a 55-foot tall beehive-shaped limestone rock formation so the kids joined us after school. To top off the day, we participated in the final Monday Midway Cruiser Cruise of the season. 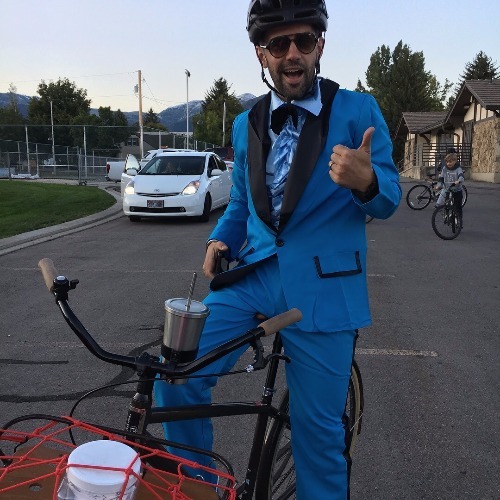 Every Monday night May through September, people in our quirky town gather for a casual bike ride on the beautiful country roads. 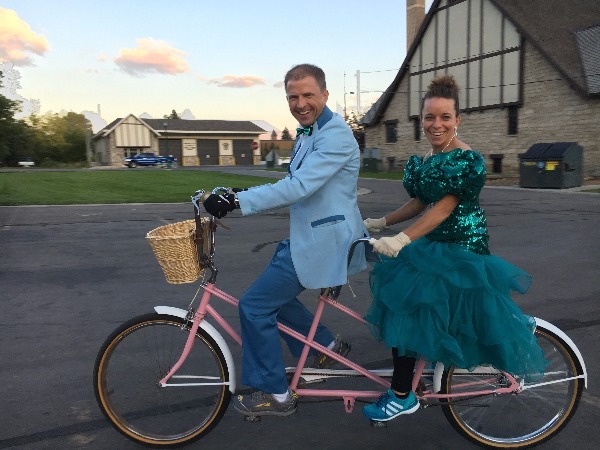 For the final ride of the season, organizers christened it “The Bike Prom” and it was so fun to see all the awesome costumes. 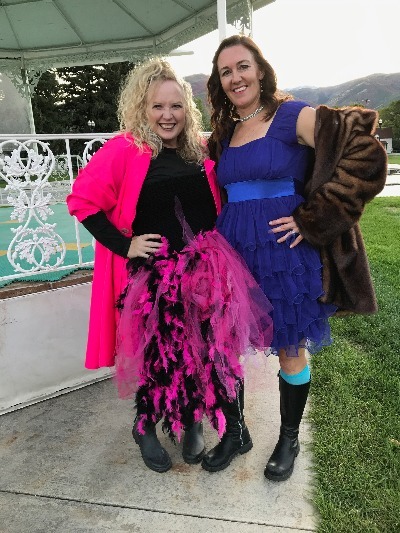 Jamie called me a flamingo but Hadley’s friend Zoe said I looked like a 1980s princess with this ugly outfit I found at the local thrift store. 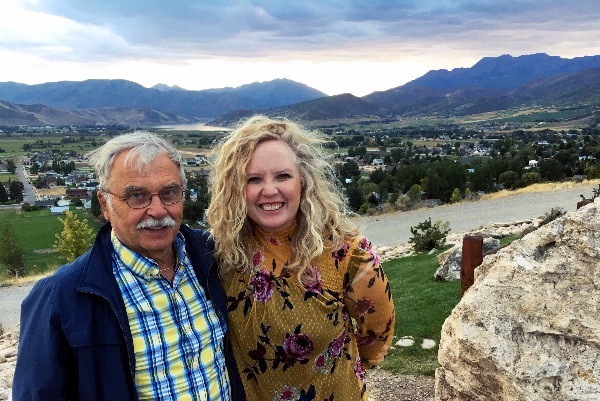 For Dad’s final full day, we did the Park City tour! We drove up Guardsman Pass with the oaks and maples positively on fire, cutting over to Park City where we strolled along the Poison Creek Trail past Shoe Tree Park and cutting over to historic Main Street. We had a late lunch at Cafe Zupas before heading back to Midway. I love love love showing off our beautiful cut of paradise and I’m so grateful my dad was able to catch a glimpse. 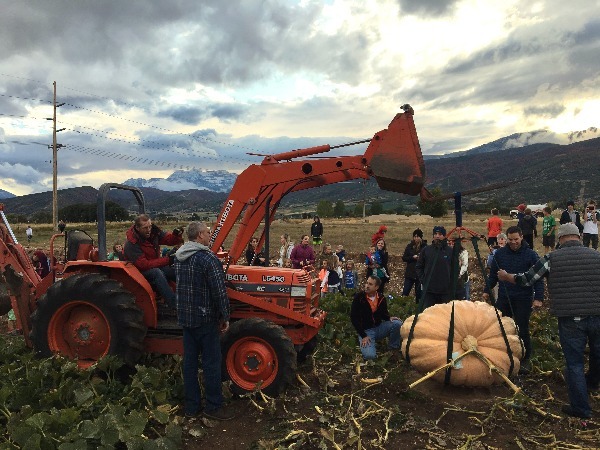 The First Annual Utah Giant Pumpkin Party & Weigh-off! I’ll admit I wasn’t too thrilled that Jamie wanted to go ahead with the pumpkin party this year. Our backyard doesn’t have any grass so I knew if it rained, it would turn into one big mud pit. 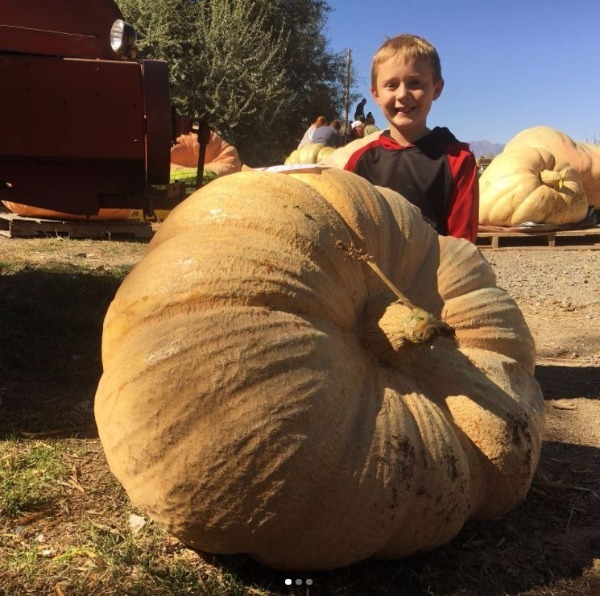 But he persisted because he put a lot of effort into this season despite the MANY obstacles he has endured (winds, deer, cold nights) and was somehow able to crank out two of his biggest pumpkins (after his legendary 1,200-pound Stanley, of course). We nervously watched the weather forecast all week and it wasn’t good. Rain. Then snow. Then back to rain again. I was convinced the whole thing would be a bust mere hours before the soiree. We decided to set up all the food in the garage and people could choose to eat inside to stay warm and dry. The weather miraculously cleared an hour before the party (apparently God is a pumpkin lover?) and we were left with a cool, brisk night. We weren’t sure what kind of a turnout we would get for the party so invited everyone we knew and lo, they did come–we estimated about 75 people! 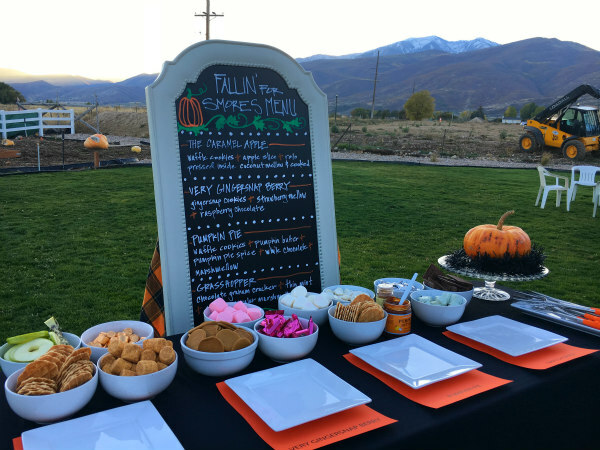 It was a fun night but part of the problem with having the food in one place and the pumpkins in another is I didn’t get to have a stitch of food…nor was I around to refill plates and drinks. I definitely failed at my hostess duties because all the action was in the backyard. 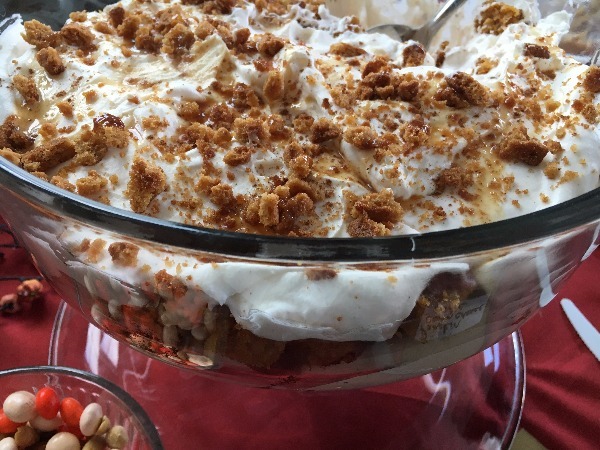 The one picture I got of all the pumpkin treats…my pumpkin cheesecake trifle. Moving onto the guest of honor: Meet “Jumbo” the pumpkin! I loved seeing everyone’s shocked expressions as the forklift lifted that bad boy out of the patch. There’s nothing quite like your first time. At the party, my friend Kelly asked, “So, do you grow anything else?” What? Like food you can actually EAT? Silly woman. 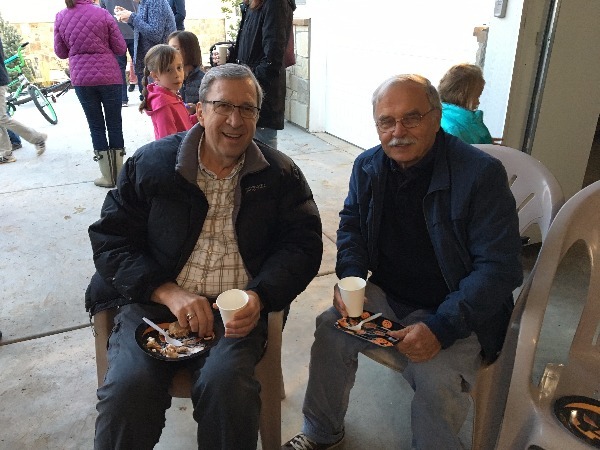 My dad was able to visit for the week from Canada and he timed his trip around the Pumpkin Party. Here he is hanging out with Jamie’s dad, Duane. I can’t tell you how wonderful it was to be with so many friends and family. 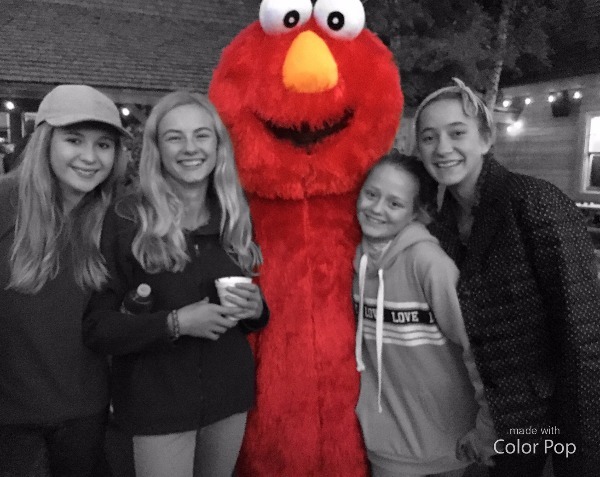 One of the things I miss the most about Colorado is having our house brimming with people…I am continually frustrated we don’t have a finished backyard or basement so there’s nowhere for the kids to play. During the party, tons of them were roaming the field behind our house and afterwards, Porter, Callie and Ellie stayed to hang out. There were two different weigh-offs two weeks apart. 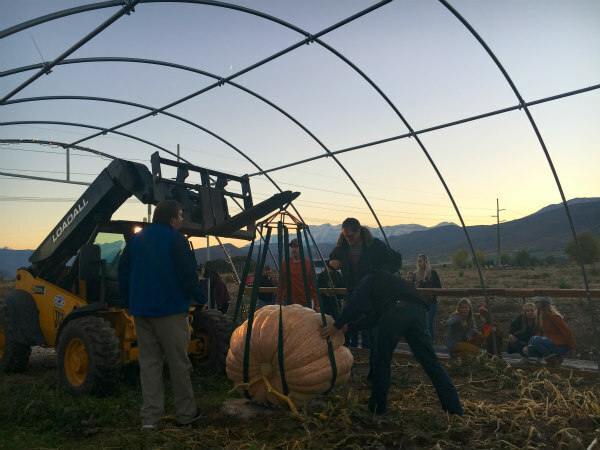 Thanksgiving Point is the larger event where the growers bring their biggest pumpkins. Jumbo was 943.5 pounds and Jamie took fourth place. Two weeks later at the Hee Haw Farms weigh-off, Jamie’s weird-looking “Cujoe” somehow beat out “Jumbo” and weighed in at 965 pounds. 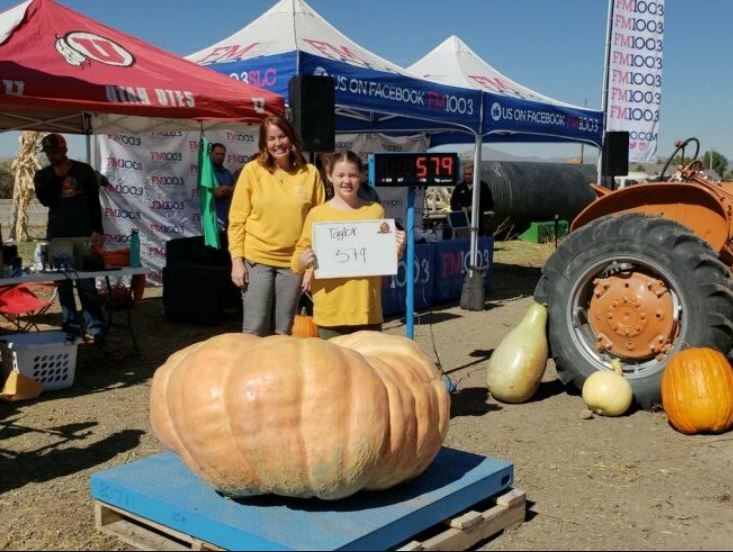 Hadley lost her plant early in the season and Bode’s “Ugly Duckling” pumpkin weighed 210 pounds. Both boys took fourth place. All in all, it was a successful first growing season in Utah. Jamie is planning to install a high tunnel (similar to a greenhouse) in the corner of our lot, which should help with our weather challenges. As happy as he was with the final results, he was reminded how far he still has to go. Matt McConkie consistently dominates the competition and this year, he set yet another Utah state record: 1,974 pounds! Looks like our pumpkin boy has some catching up to do. 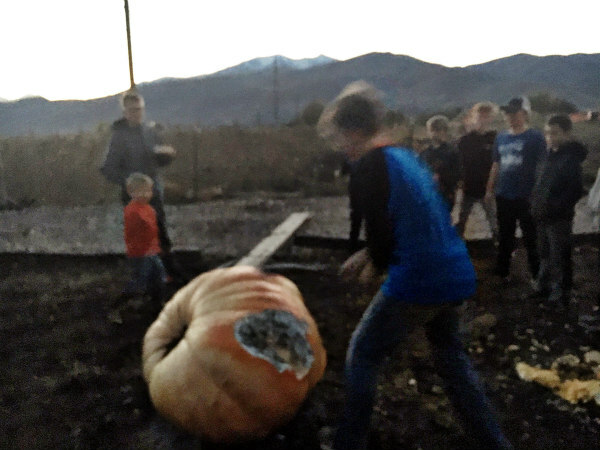 Tonight is our First Annual Pumpkin Party in Utah and apparently I have just a few anxieties about it, most notably the fact that there is rain in the forecast and our backyard is one big expanse of dirt a.k.a. mud pit. But little did I know it was much worse. Last night, I dreamed I was in a Bishopric meeting with several ward members that was more like a business meeting because we were reviewing company numbers. A man in our ward, Jordan, was snoring on the floor and I whispered to Jamie, “Let’s not sleep next to HIS tent for the ward camp-out” and I was freaking out because it was taking forever and I still needed to setup for the party. When it was finally finished, Jamie and I cut through people’s garages and yards to make it back in time but he was much faster and took off. Then I got attacked by a pack of five dogs and I shouted to him to help as they bit me but to no avail–he was long gone. I frequently have a dream that I’m in a dangerous situation and I try to call out but I can’t because I’m paralyzed in fear. I finally bit one of the dogs and released myself. As I was racing out of the yard, I started talking to my former neighbors in Colorado, Angella and Steve. 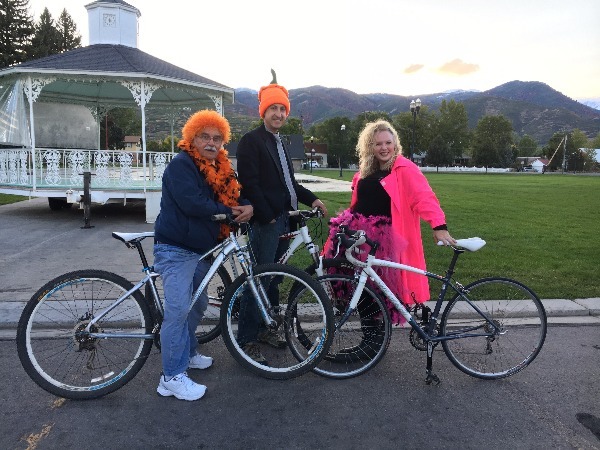 Angella would always go above-and-beyond with bringing the best pumpkin treats for the party + she and her family would pose in costume with The Great Pumpkin every year and send the picture to all her clients. They were great supporters of The Beast. “I’m going to make my pumpkin treat tomorrow morning,” she said. I learned the terrible truth: Jamie had put the wrong date on the invitations. Then my alarm went off and I woke up in a panic. Jamie says my dream confirmed to him that I have issues and my reply to that is it confirmed to me that when pumpkins are involved, he will leave me to the dogs. I joked with Jamie that despite the fact I’ve long worked in the media, he has been interviewed way more times than I. Never mind that he’s never actually won a pumpkin competition (besides his first one); the media swarms to him like honey. That Pumpkin Man is newsworthy, no matter the size of his pumpkin. 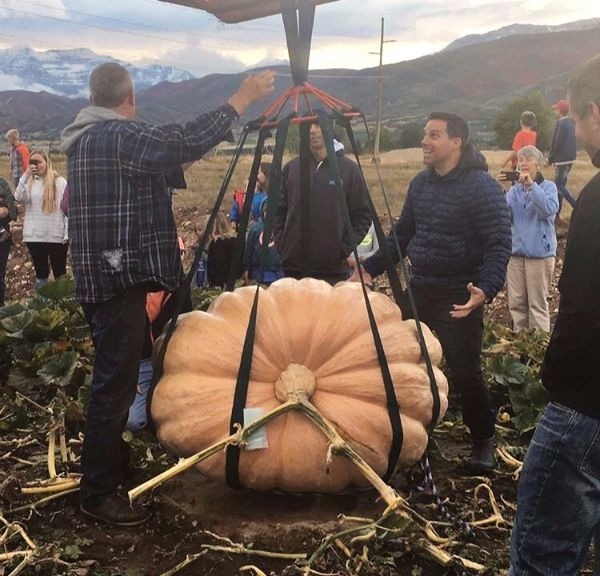 Last week, he posted a picture of the pumpkin in our valley’s private Facebook group and asked to borrow a chain for lifting. The comments and “likes” were over-the-top. 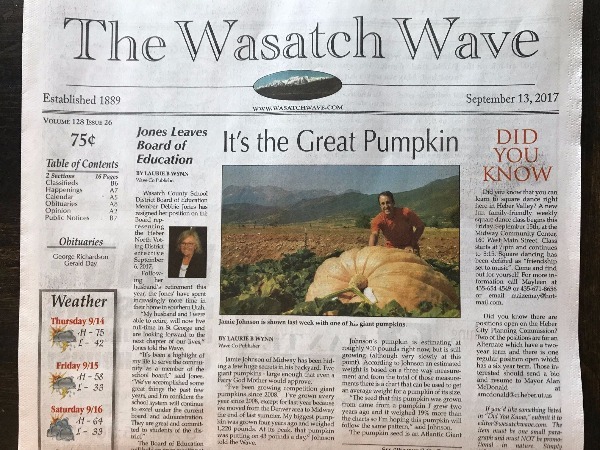 He had the Wasatch Wave (our valley’s newspaper) reach out and ask him to send a picture. They made him the front page feature story. If there’s anything that brings joy, it’s a giant pumpkins. Watch the news story on Fox 13 or see below. 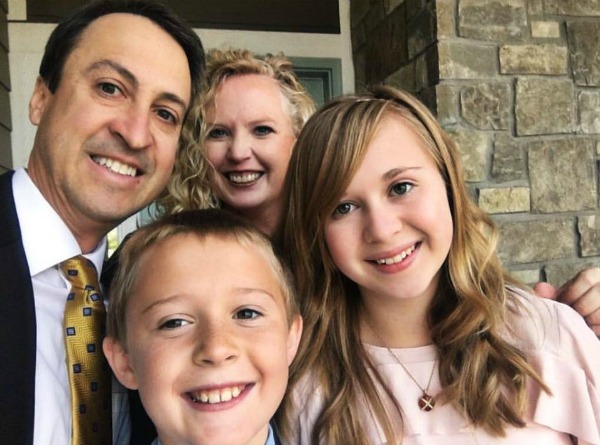 Jamie and Amber Johnson have a handful of terms of endearment for one another, but there’s one that’s off limits. 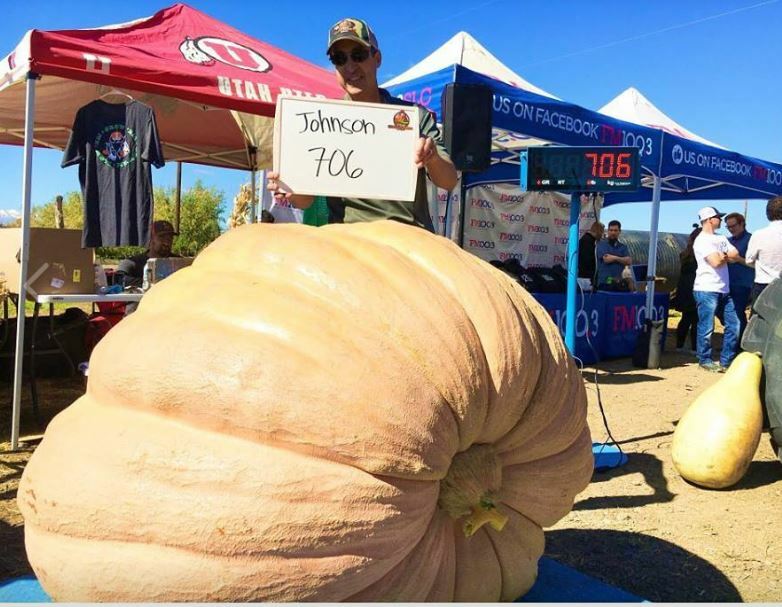 It’s a passion that started for Johnson a decade ago after he grew a few “small” pumpkins in his backyard in Colorado. 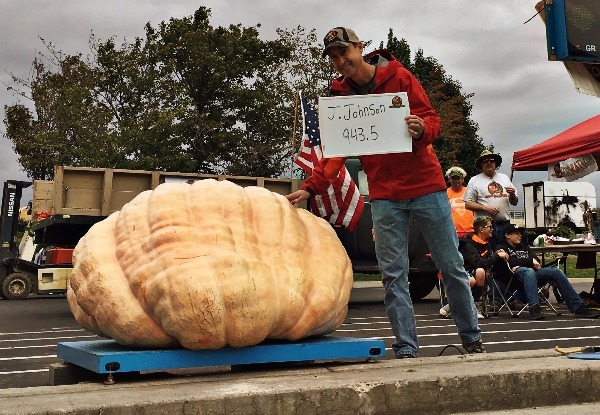 “This one’s still growing,” Johnson said as he pointed out the biggest pumpkin in his backyard, which he estimates weighs around a thousand pounds. 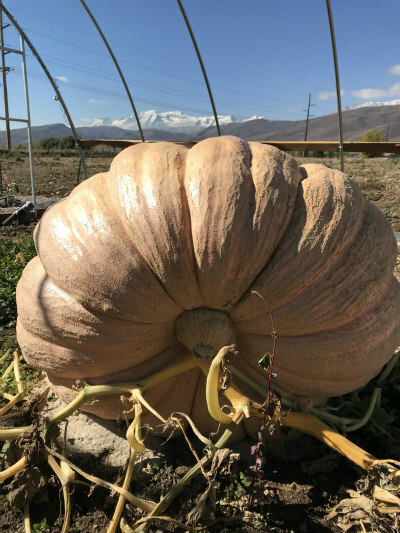 He says the best dirt for growing pumpkins sits on a geographical line between Rhode Island and Oregon, known as the “Orange Belt,” but, he says, the biggest key is the seed. Middle school is fine. I’ve mentioned the fiery pits of Hades we endured the last few months of seventh grade but so far so good. 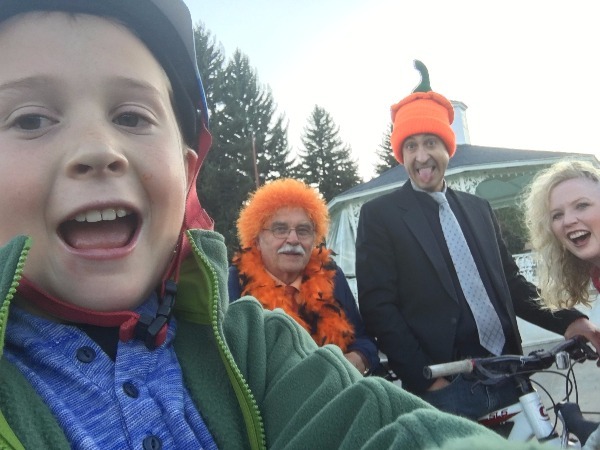 The kids are quasi-enjoying themselves, half the school has a crush on Hadley so she’s a giggling, texting teenager (but still bombing math) and Bode has acclimated to changing classes. I’m bracing myself for the worst but pleasantly surprised the bottom hasn’t fallen out. Yet. 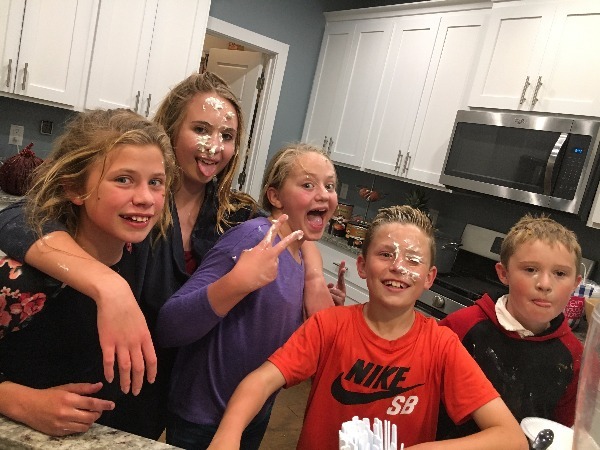 I have made a point to never over-schedule my kids but having tweens/teens is a different ballgame. They used to play for hours outside with friends or with their toys but now, downtime to them means technology time and I’ll be darned if I let them waste away in front of their screens so it’s a daily battle. Bode’s schedule picks up this week and he’ll be juggling piano, rec soccer, coding class at the library and 11-Year-Old Scouts. Hadley is the bigger challenge. She’ll have volleyball and skiing this winter but for now, the only thing she has a desire to do is photography. Fortunately, that gets her outside but I’ve given her fair warning she needs to figure out something active these next months–for her sanity and my own. The devastation in the world has felt overwhelming. Hurricanes Harvey and Irma. An earthquake in Mexico and the west set ablaze by wildfires. 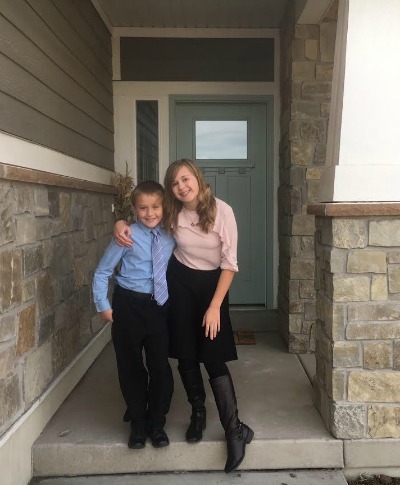 I’m not a doomsdayer but it’s tough to ignore the many signs of the times and we’ve been studying them in the scriptures with the kids at night. Nothing has hit closer to home than when my BFF Stacey sent me an article that my beloved childhood playground–Waterton Lakes National Park–is on fire and teams are trying to save the iconic Prince of Wales hotel that stands as sentry over the valley. This crap just got real. 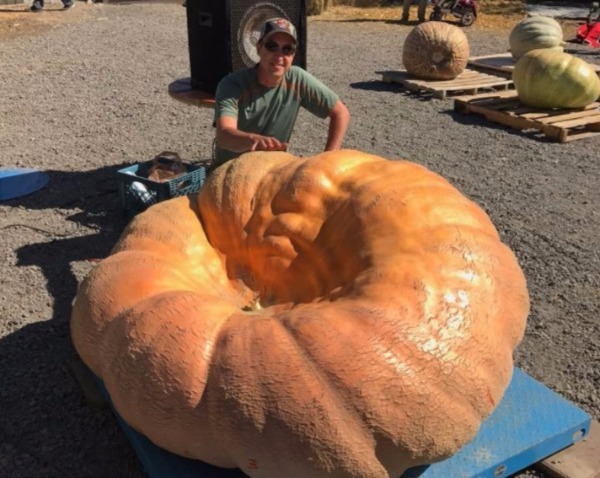 On a lighter note (or rather, literally much heavier), pumpkin season is in full swing and despite so many challenges growing in a new environment (that include deer, snow, cold nights and extreme winds), Jamie has managed to crank out a respectable pumpkin that is measuring around 800-1,000 pounds. We’re throwing our annual pumpkin party next week to confirm to our new friends just how strange we are and then it will be off to the weigh-off. 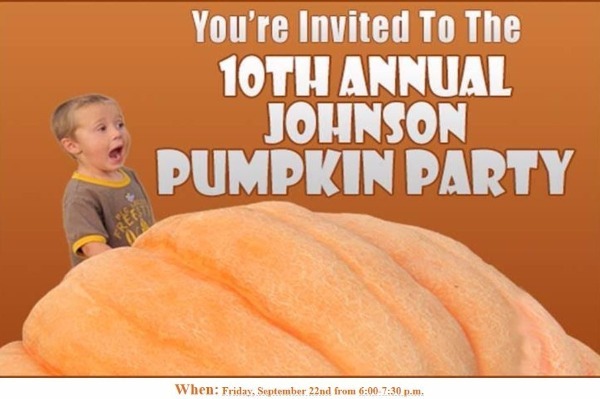 Our local newspaper is publishing a picture of his pumpkin tomorrow and the chamber is trying to finagle the pumpkin to make some celebrity appearances at local media events. 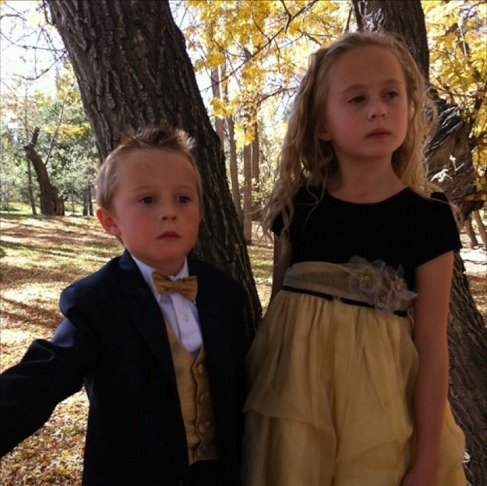 If he was well-known in Denver, he’s going to be downright famous in our little valley. My Facebook memory for today: That time when NBC’s promos hit for the Marriage Ref. Halloween was a blast in Denver. Pumpkin patches. Pumpkin parties. Weigh-offs. Truck-or-Treats. Neighborhood fire station party and parade. And, of course, trick-or-treating. I asked my friend Andrea what people do in Midway for fun on Halloween and it seems comparatively low-key. She asked what our family does for fun.